If a friend invited you to a ‘Stack and Whack’ would you assume you’d been asked to attend, a. a pancake eating contest, b. a display of logging skills or c. an encounter with a homicidal maniac? Likely the last possibility to cross your mind would be an introduction to a group of gentle people stitching fabric together. In other words, a quilting society. Quilting, a combination of art and mathematics, has vividly descriptive terms all its own. "Stitching in the ditch, fat quarters, fat eighths, lazy angles and companion angles" all describe specific techniques. The names of patterns reflect the society in which they were designed. "Double Wedding Ring", "Kite’s Tail", and "Log Cabin" go back to Colonial times in the U.S. "Cabin Fever", "Shallow Crossing", "Land of the Midnight Sun" and "Once Upon A Barn", reveal their designer’s environment. "Underground Railroad" and" Fifty-Four-Forty-or Fight" commemorate historical events. "Fried Chicken", "Endless Blues", "Serpentine" and "Where’s The Logic?" are purely whimsical, proving that quilters of all eras possess above average senses of humour. Like much of our western heritage, quilting combines new technology with traditional spirit. Quilters no longer use scraps of discarded jeans and jumpers to piece together a quilt. Fabric now-a-days may be hand-dyed batik from Bali or silk from Japan. However, today’s quilters, just like our pioneer ancestors, create beautiful and useful items which they often give away. Quilting, piecing together three layers, top, batting, and backing, is a very old skill. One of the earliest examples, a stuffed quilt made in Sicily about 1400, is in the Victoria and Albert museum in London. In pioneer times there was no manufactured bedding. Rich people hired someone to make it for them. Poor women pieced together scraps of left-over printed fabric or bits from clothing too ragged to wear to make bed covers and hangings for doors and windows to keep out the cold. A quilter in early North America would have one dress for Sunday best. When it wore out, it became pieces in a quilt. The first cotton mill in Canada began production in 1845 but not until 1880, after the U.S. Civil War, was there a regular supply of commercial fabric. Materials quilters used were often taken from their own farms; wool, down from geese, flax spun into cloth. They could only dye the threads after weaving them and their choice of colours was small. Quilting was done by hand. The Singer needle sewing machine, invented in 1851, was not readily available, especially to poorer women. Often the only times hard-working women on isolated homesteads could get together was at a quilting bee. Invitations went out to the neighbours, carefully including the best quilters. .During the day women exchanged news, recipes and quilt patterns as they worked. At supper they were joined by their men and, in the evening, there was a dance. The more men a young woman met, the better her chances of getting married. Young men, of course, had an opportunity to assess their prospective wife’s abilities as a housekeeper after seeing her quilting and eating her food. These women, quilting first by candle light, and, after 1860, by the light of kerosene lamps, turned a utilitarian pastime into a lively social event. 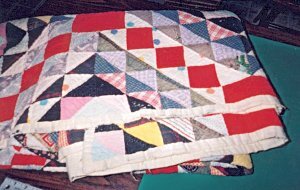 Women kept blocks of quilting patterns as examples from which to work, often patterns which had come with the first settlers. So, "The Rocky Road To Dublin" became "The Drunkard’s Path". Carrie Hall, in her "Romance of the Patch work Quilt in America" refers to the "New Englanders, with their abstract and positive theologies, the Dutch with their home-making instincts and the luxury-loving Virginians." Their quilt designs imitated their life styles. The westward journeys, after the Revolution, brought women from these varied back-grounds together; an unprecedented opportunity to exchange patterns! Much the same happened with the settling of the Canadian west, as Swedish, Ukrainian, German and English women mingled their quilting traditions with those of Americans moving up from the south. Sewing in general was a livelihood for women who didn’t marry or who were widowed. An accomplished seamstress would always find work. When quilt patterns began to be published in newspapers, the women who designed them were paid. Again, today, many women are making their livings designing, writing and teaching about quilting. Californian Mary Ellen Hopkins, a great influence on modern quilting, who began sewing to support her children, now teaches world wide .U.S. designer Kay England has her own line of fabric. Australian Gloria Laughman not only designs, but dyes and paints all her own fabric. Quilt designers and teachers are esteemed and sought after, just as they were in the 1800s. Dianne - Where's the Logic? Dianne Jansson, from Chase, B.C., has taught throughout western Canada, and from Iceland to Australia. Her classes in Canadian traditional quilting offer glimpses into Canadian history. Dianne thinks Canadians are just at the stage of being really interested in their own history. Asked to comment on national differences, she says Canadians usually follow the traditional mode, Americans are generally more adventurous and Australians are used to drafting their own patterns from high school onwards. Wherever she’s gone, quilters have welcomed her and her family, taken them into their homes. 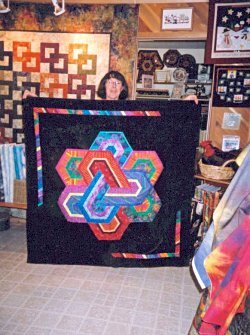 A quilter is part of an international circle of friends. There are other benefits. On her way to a quilt show in Seattle, Dianne was challenged by a U.S. border guard. "Where are you going and what do you do?" he asked. "I’m a quilter." Dianne replied. "Let me see your fingers." He demanded. Dianne held them out. He looked and passed her through at once. When quilters gather in numbers these days, they don’t come by buckboard from the surrounding town-ship. They come from Europe, Scandinavia, and, by planeloads, from Japan, for the big quilt show and sale in Houston, Texas. During the two days of classes and one day open show and festival there are ten thousand people of all ages on the site at any moment. In her book "Quilt Works Across Canada", Gail P. Hunt, of Prince George, B.C., writes about patterns common to all mankind. Quilting proves she’s right. Euro-Quilt magazine is printed in six languages. There are quilt books in French and Japanese, which are perfectly intelligible to Canadians. After all, say quilters, you don’t need to read the language to follow the diagrams. It’s estimated that there are ten million quilters in the U.S. and well over a million in Canada. There are more quilters per capita in rural areas but it’s increasingly popular among urbanites. Small quilt shops are everywhere. Over one hundred companies in North America have sprung up to supply them. The scale of some suppliers is amazing. Keepsake Quilting, in New Hampshire, has over one thousand patterns and one hundred thousand fabrics. The undisputed giant, Hancock’s in Paducah, Kentucky, began in 1952 as a fabric store catering to small towns. It now has over sixty thousand square feet of buildings, forty employees, imports fabric from round the world and ships to seventy two different countries world wide. Quilters insist on top-notch fabric. As one said , " If you’re going to spend two hundred hours making something, you don’t want it to fall apart. " From Brisbane to Bali, quilting is a largely unrecognized financial success. But, isn’t it a relic of olden times, which should have disappeared with kerosene lamps and scrub boards? What happened? 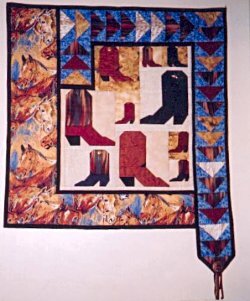 Pioneer quilting peaked about 1880. There was a small revival during the depression of the 1930s. It attracted attention during the American centennial, the 1960’s and 1980’s but really picked up momentum during the 1990’s, when varieties of fabric and improved machines were available. It’s now a world-wide industry. Our pioneer ancestors would be pleased. What’s the attraction? Modern women can buy bedding. Today’s houses are well-insulated. There are certainly other ways to meet men. The answers modern quilters offer would be familiar to quilters of long ago. In 1933 Carrie Hall recommended quilting as a way to relieve "stress and tension of the jazz age." Dianne Jansson agrees. "It’s a solace, an ‘out’ a safe, acceptable stress reducer. Better than going to an analyst because, at the end of the session, you have something beautiful!" "Relaxing and an outlet for creativity", say quilters ".Creating a pattern out of fragments." "Making something you love for people you love." "It’s about sisterhood and sharing," others note. Having a mathematical mind, steady hand and keen vision are advantages for a quilter. Just as important is a feeling for colour, line and effect. Quilters of the 1800s found inspiration for colour and form in their gardens. They used simple dinner plates to mark circles. Many of them were unlettered. Yet no one can deny that their quilts are harmonious and lovely. Mary Ellen Hopkins believes ," The whole point is to apply artistic principles to create beautiful quilts without having to go to school to learn art theory." 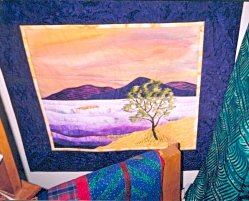 Quilting has always gone on out of sight of the official artistic community. Quilt Exhibit in Breda. There was a quilt show and retreat at a ranch in Bozeman, Montana, and a Quilt Canada exhibit in a gallery in Edmonton, Alberta. The latter was a juried show of over nine hundred quilts. It drew the most attendance the gallery had ever had. Fifteen other quilt shows, over one thousand quilts in all, were held throughout Edmonton at the same time. Quilts now hang in the Ontario Art Gallery and in heritage museums throughout the U.S. In Australia and New Zealand there are invitation-only, juried art shows of quilts. Most quilters work from a basic pattern but give a personal flair to their quilts by their choice of fabrics and colours. Quilts aren’t just bed coverings any more. They are lap quilts, table runners, wall hangings and quilts intended solely for decoration. Quilt retreats at such posh resorts as Jasper Park Lodge attract participants from as far away as Ontario and Saskatchewan. Who are these women? They’re all ages, from young mothers to retired seniors. They have a boundless enthusiasm for the art of quilting and transmit it enthusiastically. "Quilters are optimists," Linda Hicks says from her own experience." They think they’ll have time to read all the books and use all the fabric!" They adapt to technology yet cherish the past. They have fun. "Quilting should be enjoyable for the person who does it and the person who receives it. ",declares Linda. They share the beauty they create with others. The pioneer tradition of making quilts for those in need continues. Most quilter’s groups give quilts to breast cancer survivors as a symbol of support. The Kamloops Sagebrush Quilters donate quilts to children in foster care, often the only personal items these children have. And, after the wild fires of 2003, quilters across Canada sent quilts to those who’d lost their homes. One woman who received an unexpected gift quilt was completely overwhelmed. "Imagine, someone thought so much of me that she gave me a quilt! ", she exclaimed tearfully. Our great-grandmothers would have understood and smiled.